As those close to me can attest, it's good to know a knitter, especially (but not necessarily,) around the giftier times of the year. 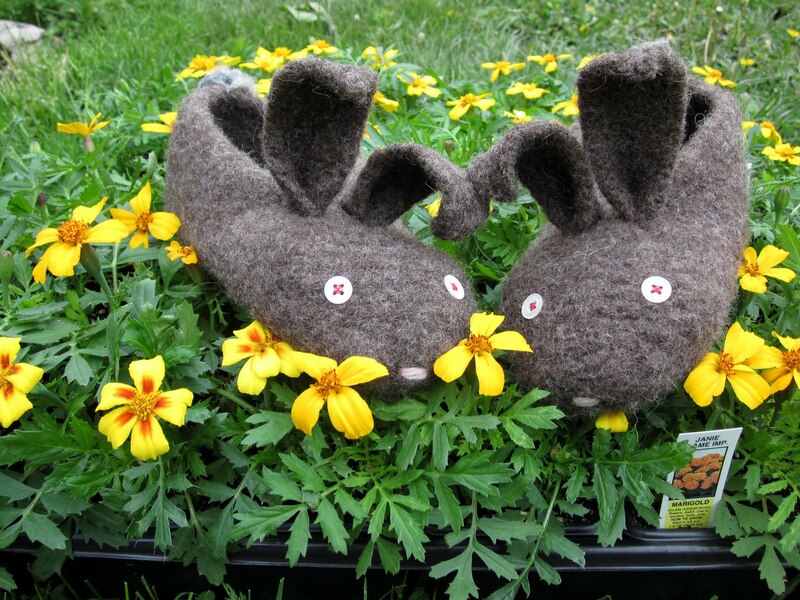 Just ask Anna whom, among other things, has had mittens named for (and gifted to) her, received a sparkly silver Birch for her birthday last year and now gets to live with these two critters: These delightful slippers are none other than the Hopsalots by Stephanie Dosen (aka. tiny owl knits.) They are adorable -- both as bunnies and as footwear. Clearly, she's outdone herself this time! Sometimes the perfect touches are lurking right under one's nose. This was the case with both their eyes (vintage mother-of-pearl buttons) and their tufty tails (half-felted bits of natural grey roving.) Once again, my everything stash came to the rescue. An ample stash isn't just nice -- it's vital. 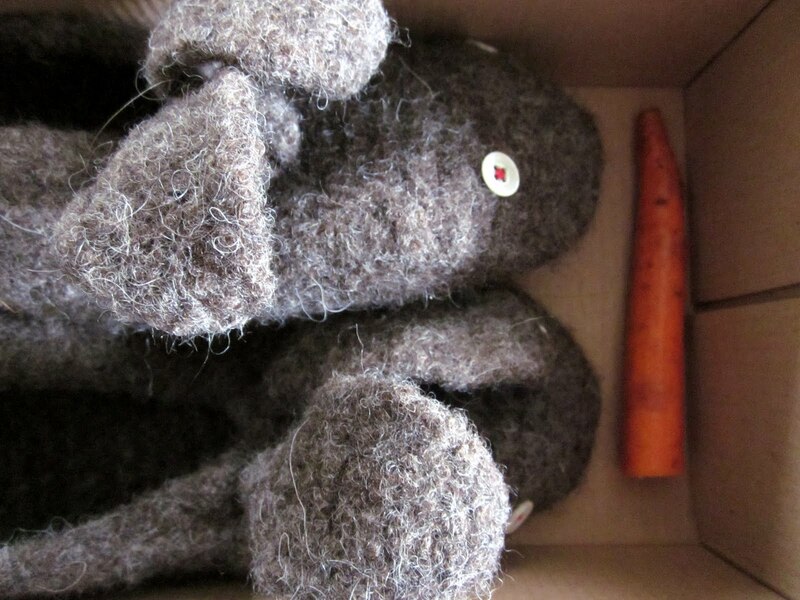 After chasing the bunnies around the back garden for some time, I bundled them into a shoebox (with air holes poked in) and gave them a carrot to share while they made the five-minute trip chez Anna. I think I frightened her a little when I handed her the box, told her that I found "them" out back and to open it -- slowly and carefully. Luckily it was Love at first sight -- how could it not be? May 15, 2011 at 1:33 p.m. This week, I have discovered that an ample stash is definitely a must...until one has to move that stash into a new apartment with less closet space, lol. 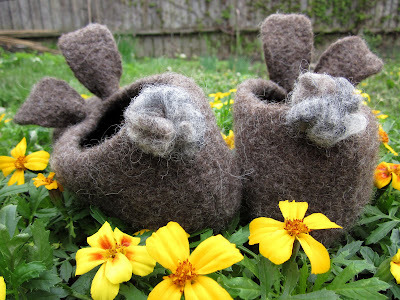 May 15, 2011 at 4:55 p.m.
May 15, 2011 at 11:46 p.m.
Well done - slippers in the wild ... with carrots, even! May 16, 2011 at 12:05 a.m. Absolutely darling! Thanks for bringing these to my attention. I've brought a number of Stephanie's designs, but haven't been to her site lately because she hasn't posted for awhile. May 16, 2011 at 7:52 a.m. I love the carrot in the box with them....they are really cute! What a great gift. May 16, 2011 at 11:27 a.m.
May 17, 2011 at 6:10 p.m.
May 18, 2011 at 1:05 a.m.
May 18, 2011 at 5:55 a.m.
May 20, 2011 at 4:42 p.m.